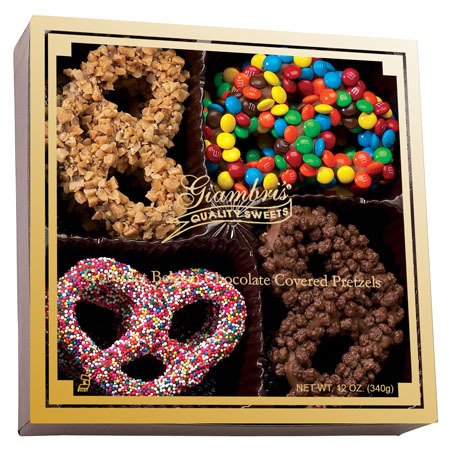 A beautiful gift box filled with four Belgian milk chocolate pretzels topped in red, green, silver, and blue sugar crystals! The perfect size gift, or treat for yourself! These were delicious! I can’t wait to order more! The pretzels were absolutely beautiful. The presentation was lovely. I would have been content to just look at them the entire holiday. However, others felt differently! Once they had their first bite, there was no stopping them. 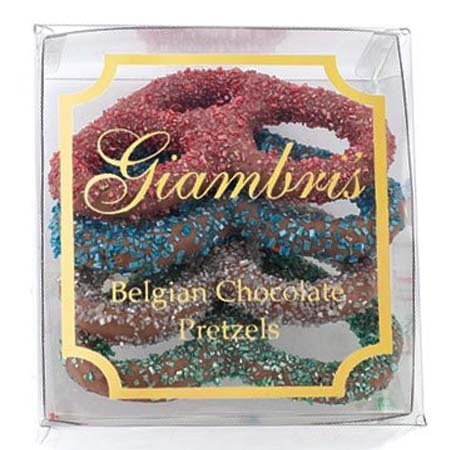 Bit by bit our exquisite pretzels were consumed. Please continue making these! They are a work of art that tastes as wonderful as they look. You made our holiday. Thank you. 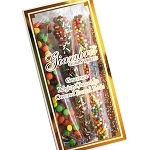 We bought 4 of these one for each of the Children in our lives and their significant other for Valentine's Day - They are totally satisfied and we'd purchase again - super downsized gift package - YUMMY! 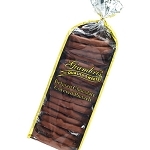 Glamorous, and delicious, chocolate covered pretzels make great gifts around the office.